Here’s Huggable—Teddy Ruxpin for the new millennium. It’s a talking blue teddy bot designed to care for and comfort hospitalized children. The New York Times reported today it’s currently being used in a study that gathers kids’ physiological responses to various stress-alleviating stimuli to determine whether Huggable offers ill children therapeutic benefits or not. Eventually, that data will be integrated in the robo-bear to make it automated and able to respond to kids’ various needs. Right now, the bear is more of a “high-tech puppet,” the Times writes. An adult down the hall controls the bear, serving as its voice, shooting the breeze with the young patient. The robot’s a collaboration between MIT’s Media Lab and Boston Children’s Hospital, which has invested half a million bucks to research social robots. As with most robots, the ultimate goal is to get it to adapt to changing situations on its own, just as humans do. So maybe one day, if a child doesn’t respond to the bear’s jokes, it could shift strategies automatically. Switching to a calmer activity might help that particular child relax, for instance. Will robots be caring for our future offspring? If the tech’s up to snuff, maybe. 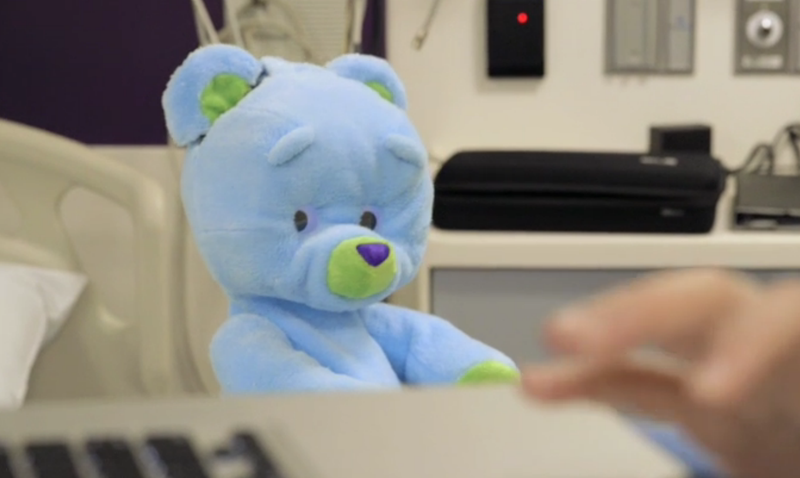 After playing with Huggable, the young patient in the Times video says the bear suffered from lagged responses and limited motion—a major problem when they tried to play peek-a-boo.